in six Walgreens pharmacies around the country, including the one by Union Square in NYC. The company’s research has shown that 75% of shoppers make decisions about what they’re going to buy from coolers on impulse. For instance, if a man is standing in front of a cooler where Coke is displaying ads, the cooler might show a Coke Zero ad since that particular product skews more male, while a woman might see a Diet Coke ad. Similarly, the doors also use contextual information like the time of day to convince you to buy more. You could pass by the beer door, and [the door] may notice that you’re picking up a six-pack of Miller Coors. It’s 4 p.m., so it’s near dinner time. [It might] offer to you, buy a DiGiorno pizza for a special price if you’re buying a six-pack of Miller Coors. 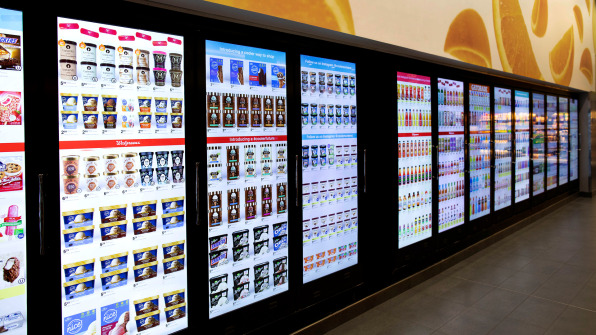 Cooler Screens already has advertising deals with more than 15 of the 20 top consumer packaged goods companies, including Coca-Cola, Pepsi, Nestle, and MillerCoors. 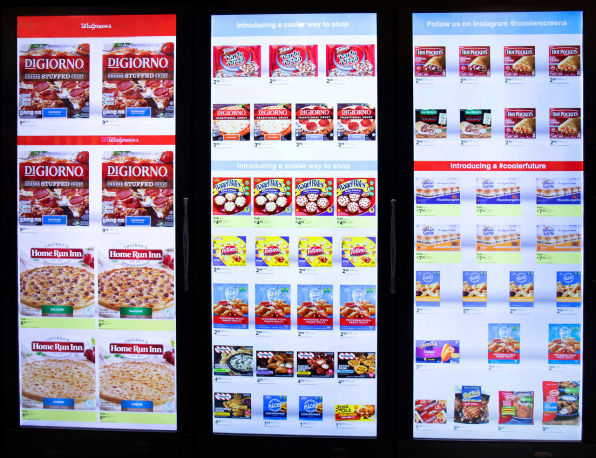 Why it’s hot: It’s real time consumer profiling and ad targeting in a physical store location. New York City has been a holdout in the electric scooter craze. A 2004 New York state law banned any motorized scooters. City Council will soon vote on four bills that include a pilot program for shared e-scooters and legalizing e-scooters that can only go up to 15 mph. A similar bill would allow for the use of e-bikes with a max speed of 20 mph. If legalized, Lime is very eager to start operations in New York City like it does in over 100 cities around the world. Governor Andrew Cuomo has given the OK for cities to figure out for themselves what to do about e-scooters so NYC is planning to vote on it. Why it’s hot: Legalizing e-scooters could forever change the streets on NYC and add a new layer to the bike-share program. New data from the Pew Research Center gives us a demographic breakdown of the newest generation many marketers will be targeting, if they’re not currently targeting them. The oldest members of this generation have already reached adulthood. Nearly half of them are non-white, they’re more likely to attend college than previous generations, and their own parents are more likely to be college educated than previous generations as well. 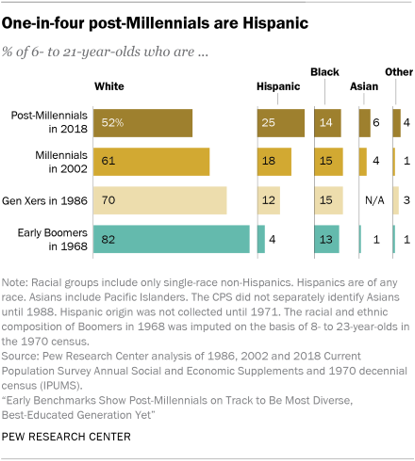 They’re significantly more likely to be Hispanic than previous generations, slightly more Asian, and noticeably less likely to be white. 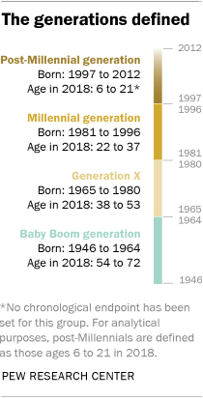 They’re more likely to have foreign-born parents than millennials are, but slightly less likely to be foreign-born than millennials were in 2002. Why It’s Hot: Gen Zs are a unique generation like any other and understanding them demographically and psychographically will be important as more marketers begin to target them. Shoe retailer Payless recently took over a former Armani store in Santa Monica, CA, stocked it with Payless products, and then invited fashion influencers to attend a “party” celebrating the store’s opening. These influencers were made to believe that they were attending a store opening for a new high-end designer called “Palessi”. These influencers paid between $200 and $600 for Payless shoes traditionally priced between $20 and $40. Many called their purchases “sophisticated” or “made with high quality materials”. Of course, later, all the influencers that made purchases did get back the full amounts and got to keep the shoes. Why it’s hot: It’s easy to fool anyone with the right marketing, branding, and positioning. And Payless had the opportunity to prove that its very affordable shoes could pass off as high-end designer shoes. The Uber rewards program is available this week for users in NYC metro area, New Jersey, Denver, Tampa, Miami, Washington, D.C., Philadelphia, Atlanta, and San Diego; and Uber promises it will roll out to all U.S. riders in the next few months. Uber has also set up different status levels for its customers: Blue, Gold, Platinum, and Diamond. Every six months, an individual’s Uber points are tallied and at 500, 2,500, 7,500 points respectively, they jump to the next tier for the next six months. Since the program looks at your ride history from the past six months, by the time you’re enrolled in the program you might be Gold, Platinum, or Diamond status to start. You’ll get one point for every dollar spent on Uber Pool rides and Uber Eats orders. Two points for ordering an UberX, UberXL, UberSelect, or UberWAV ride. Three points for ordering UberBlack and UberBlack SUV rides. Uber users will get a $5 credit for every 500 points they earn. And this credit can be used for rides or Uber Eats. Riders can keep their current status level for six months. If during that time period they don’t spend enough, they can drop down the tiers. For example, a Gold member would need to earn 500 to 2,499 points over six months to maintain that level for the following six months. Why it’s hot: modeled after airline rewards programs, time will tell if this rewards/loyalty program will boost Uber ridership among existing users. In October, Fortune magazine and Harris Poll surveyed over 2,000 American adults representative of the overall population to measure their perceptions of large tech companies. Why it’s hot: With repeated news of how Facebook mishandled the private data of its users, Americans seem to have an increasingly negative perception of the company. And this might be reflected in the stagnation of its daily active users in North America. 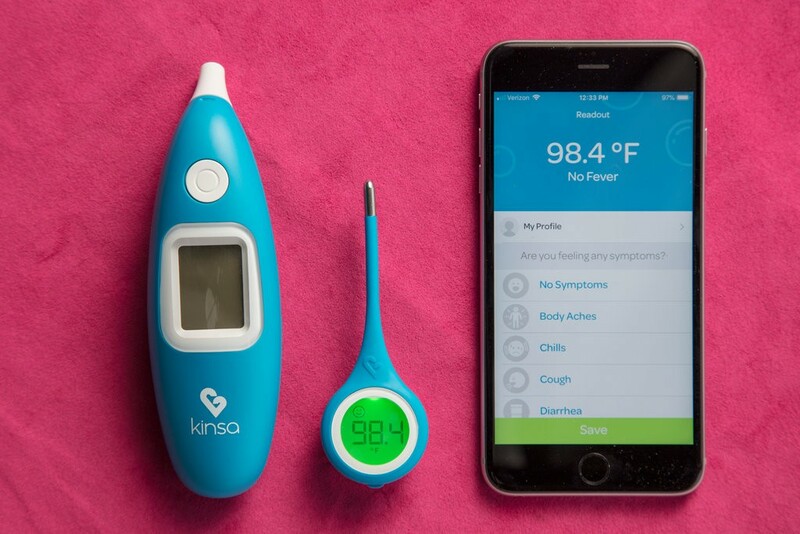 Kinsa is a tech start-up sells internet-connected thermometers that sync up with a smartphone app that allows consumers to track their fevers and symptoms. These capabilities make the app especially attractive to parents of young children. Kinsa says its thermometers are in more than 500k American households. This year and last year, Clorox paid Kinsa for access to real-time data on which zip codes around the country are having increases in fevers. Clorox then pushes more ads to those specific areas assuming that households there may be more likely to buy their products like disinfecting wipes and sprays. They may also pull back ad spending in healthier parts of the country. So far, consumer interactions with Clorox’s disinfectant ads increased by 22% after using Kinsa’s data to target these digital ads. The information shared with Clorox was shared in a privacy-compliant manner because Kinsa says no identifying personal information is shared with other companies. Kinsa says that such data was also sold to pharmacies and drug manufacturers who used this data to stock more cough and cold products in areas that had increases in fevers. Kinsa said the data provided unique insight into flu-related illness in specific areas. “We can tell you if it’s high or low, whether it’s rising, if it’s bigger than the three- or five- year average, when it’s going to peak and how severe the symptoms are, too,” said the company’s founder. Why it’s hot: As more products get connected to the internet, it means more consumer data can be collected, which means greater opportunities for advertisers to effectively target their advertising. Who seems to be winning the midterm elections on social media? The New York Times analyzed data from one month’s (9/15 to 10/15) worth of social media activity by nearly all of the Republican and Democratic candidates running for House, Senate or governor this year. 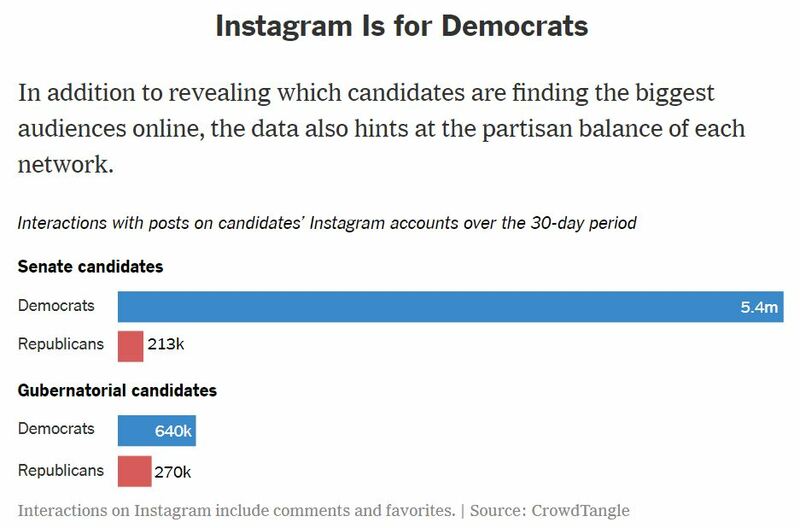 This data came from organic-only public content published to the Facebook and Instagram pages of these candidates. Measuring total interactions on social media is an imperfect way to gauge a candidate’s electoral chances, in part because it does not distinguish between types of engagement. A negative comment left on a Republican candidate’s page by an angry Democrat would still count as an interaction, for example. In addition, it does not account for the fact that some candidates have more followers than others. But social media engagement can be a crude measure of popularity, and a bellwether of shifts in public opinion that often turn up in polls days or weeks later. In 2016, many polls and pundits gave Mr. Trump little chance of winning, but his performance on Facebook was soaring, bolstered by millions of dollars in targeted advertising. His digital campaign director, Brad Parscale, later credited Facebook’s scale and influence with his victory. 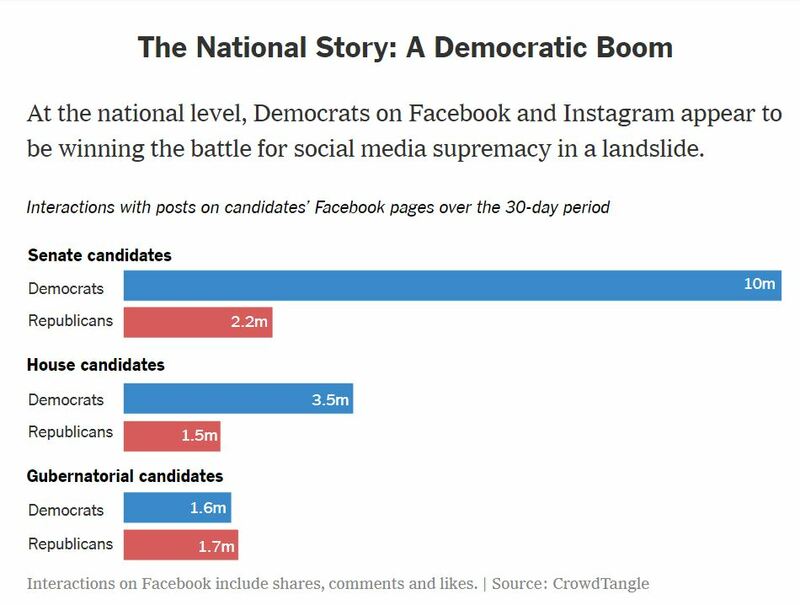 Democrats running for House, Senate and governor’s seats in this fall’s elections received a combined 15.1 million interactions on Facebook in the 30-day period, roughly three times the 5.4 million interactions received by Republican candidates. Why it’s hot: we’ll find out this election day that to what degree we can link social media popularity to winning elections. Will there be a blue wave this election day? 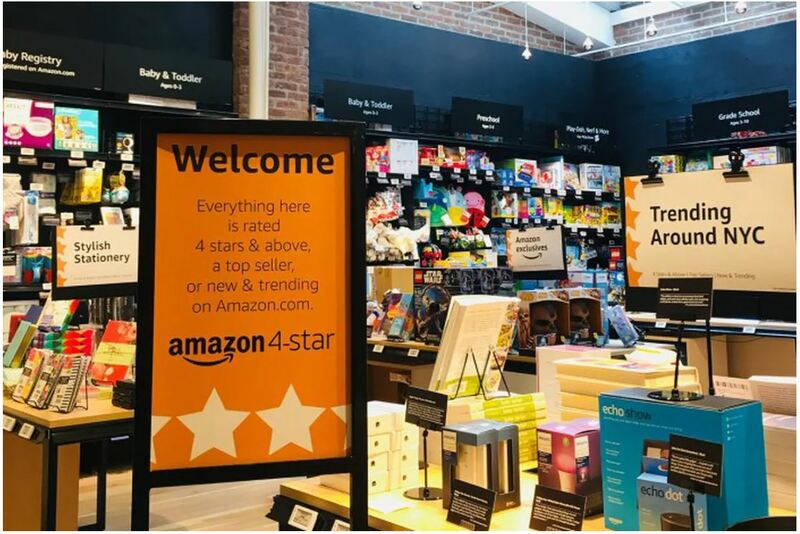 Amazon just opened their first-ever 4-star store. It opened in SoHo in New York City. And as the name implies, everything on its shelves has earned at least a four-star review average from Amazon’s customers. The store sells: devices, consumer electronics, kitchen, home, toys, books, and games. Amazon Prime members will pay lower prices than non-members. This is essentially a “customer curated” physical store from an e-commerce retailer. It’s also tailored to local buying habits because it features products “trending around NYC” in addition to the 4-star + products. Sandvine, a networking equipment company, just released the Global Internet Report 2018. 58% of the total downstream volume of traffic on the internet is VIDEO. 15% of the total downstream volume of traffic across the entire internet is Netflix. 19% of total downstream traffic in the US is Netflix. At peak hour, that number can spike to 40% on some operator networks in the US. The social network rankings are interesting, because user population does not always translate to network usage. More video-heavy social networks are responsible for a greater share of global internet traffic. YouTube was not placed in this category because it would skew the results. Why it’s hot: video content and video streaming are the future of the internet, at least in terms of its share of global internet traffic. This is true not just in North America, but around the world. BuzzFeed News has obtained details of the proposals, which would see the establishment of an internet regulator similar to Ofcom, which regulates broadcasters, telecoms, and postal communications. The UK government is preparing to establish a new internet regulator that would make tech firms liable for content published on their platforms and have the power to sanction companies that fail to take down illegal material and hate speech within hours. 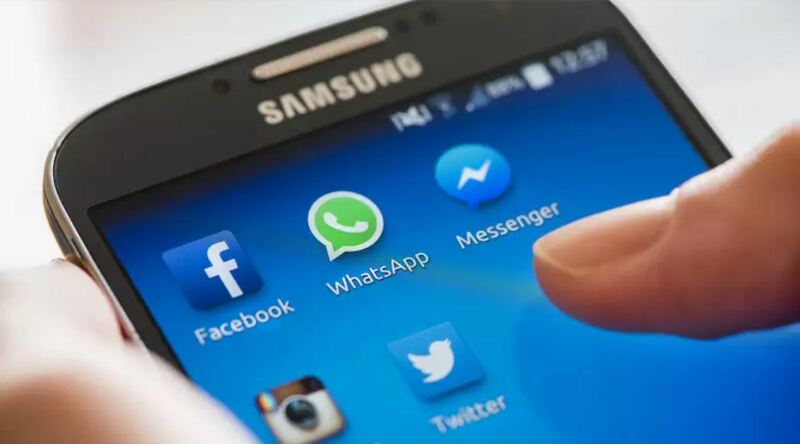 Ministers are also looking at implementing age verification for users of Facebook, Twitter, and Instagram. 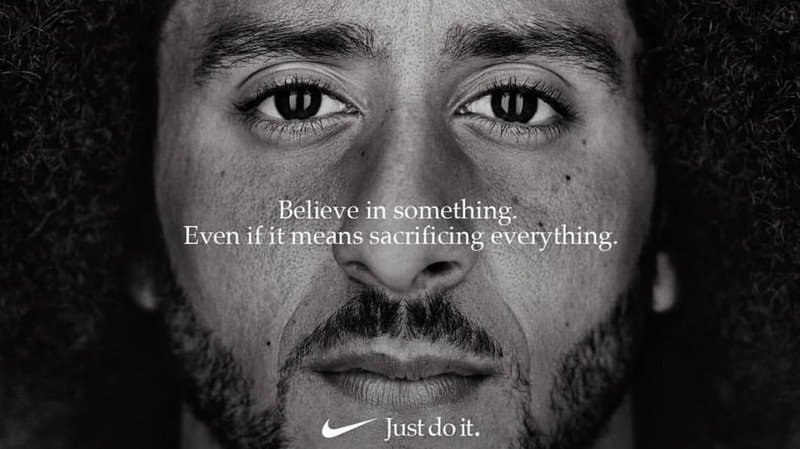 A new survey by Morning Consult says that since Nike debuted its stunning new Colin Kaepernick ad, the brand’s favorability and consumer purchase consideration have significantly sunk. According to the survey, before the Kaepernick announcement, Nike had a net +69 favorable impression among consumers. That has now dropped by 34 points to +35 favorable. Before the ad, 49% of Americans said they were absolutely certain or very likely to buy Nike products, and that figure is down to 39% now. 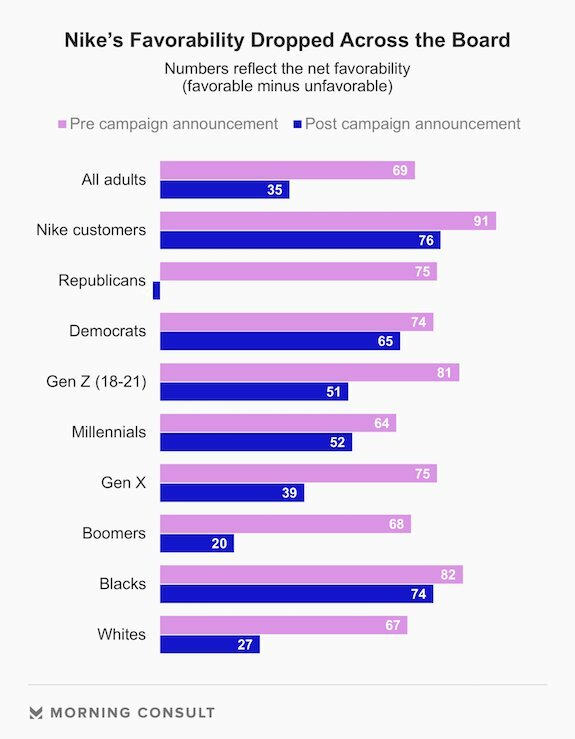 Not surprisingly, Nike’s favorability has dropped dramatically among Republicans and baby boomers who are unlikely to agree with Nike’s messaging. It’ll be important to see how these numbers change in a few months since their overall favorability has dropped significantly among all American adults. This might be a case study on whether or not large brands should get involved in polarizing political discussions and how they might be alienating certain consumers by picking a side in a very divided America. Social networks like Facebook, far from serving merely as entertainment for youngsters, are central to modern life, influencing the way people work and play. Social connections formed online now help shape many people’s identities in the real world. New research suggests that our social media networks tell us more about ourselves than we may think. A study published last week in the Journal of Economic Perspectives by researchers from Facebook, Harvard, NYU and Princeton analyses the social “connectedness” of Americans, as measured by friendship links on Facebook. Using aggregated and anonymised data, the authors find that Americans with tightly clustered social networks comprised mainly of friends located within a short distance of their home tend to have lower incomes, lower levels of education and lower life expectancies. Those with more geographically dispersed social networks tend to be richer, more educated and healthier. 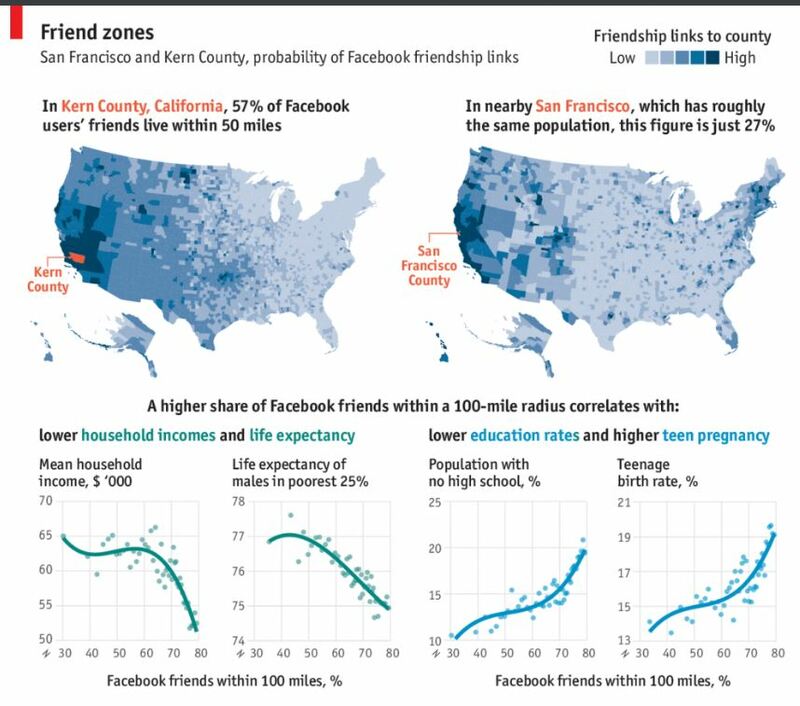 The geographic locations of your Facebook friends says a lot about your socio-economic mobility, health, and education levels. Those with more Facebook friends close by to them are more likely to have lower household incomes, life expectancy, and lower education rates, for example. The opposite is true for those with more of their Facebook friends spread out around the country & world which probably correlates with higher socio-economic mobility meaning better health and education levels, for example. 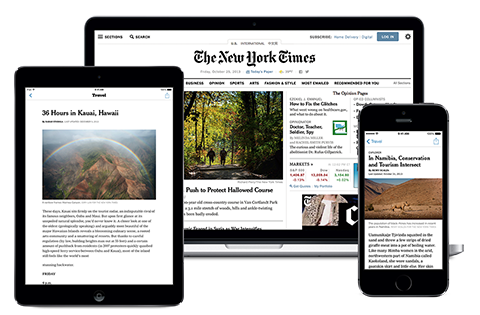 The New York Times continued its digital growth in the second quarter of 2018, adding 109,000 digital-only subscribers. With that rise came an increase in revenue that counteracted a decline in print advertising. The company said on Wednesday that revenue from digital subscriptions rose to $99 million in the second quarter, a jump of nearly 20 percent compared with the same period a year ago. Over all for the second quarter, total revenue increased 2 percent, to $415 million, and the company reported a profit of almost $24 million. The Times now has 2.9 million digital-only subscribers, out of 3.8 million total. As a “newspaper” media company, the New York Times now has significantly more digital-only subscribers than print subscribers. 76% of its subscribers are digital-only. 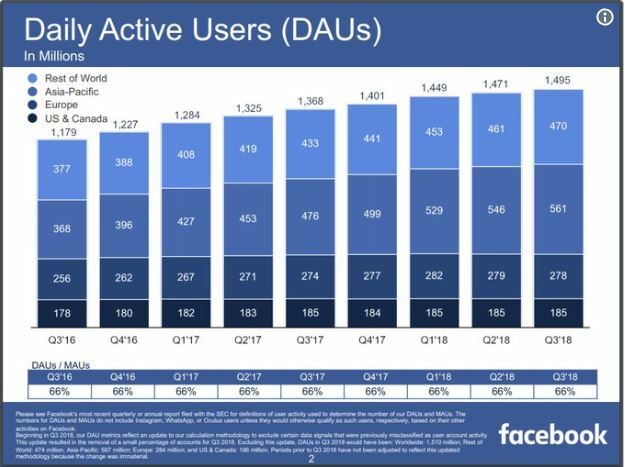 Also, subscription revenues are now two-thirds of the company’s revenues which means the company doesn’t rely on advertising for revenues as much as it did in the decades past. The ad industry, run by people who pride themselves on creativity, is being displaced by the ad business, which prides itself on efficiency. Clients are spending less on the kind of entertaining, seductive, fame-generating campaigns in which ad agencies specialize, and more on the ads that flash and wink on your smartphone screen. Modern media technology, more educated consumers, and the democratization of information have transformed the advertising business like no other. Today’s advertising agencies may not be able to help clients market mediocre products like they could have in a much simpler time.